The heavy palisade slams shut behind him as men rush to position along a glinting rock wall. From 150 feet above the valley floor, they watch as silhouettes begin scaling the boulders below. With a signal, arrows and stones rain down upon them, yet the marauders advance, dragging their weapons or clenching them in their teeth. One brawny group attacks the wall with a battering ram but the rampart holds firm. In the end, wounded and spent, the intruders slink back to their ship in the darkness. As the sun rises in 2018, that Iron Age hillfort is still standing. 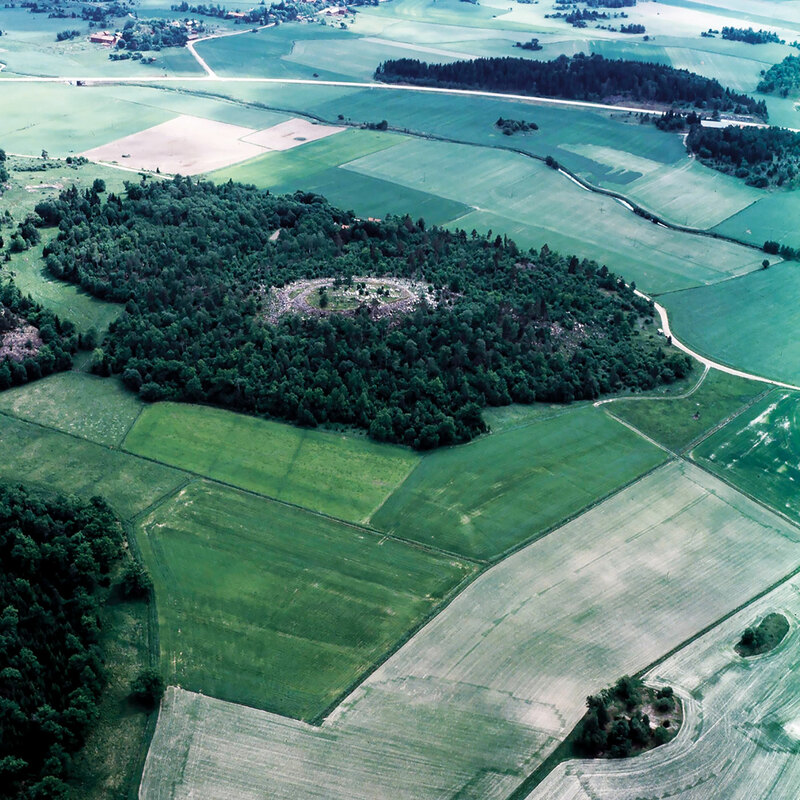 The Broborg (pronounced Brew-boy) castle, built around 450 C.E., remains surprisingly intact, one of the best preserved of the thousand or so defensive forts scattered throughout Europe. Located north of present-day Stockholm, Broborg provided protection as well as a means for collecting toll along what was once a major waterway. It was not always appreciated. The hillfort endured countless attempted sieges but survived 1,500 years thanks to the glassy substance that still holds it together. With a technology modern researchers have yet to duplicate, prehistoric Scandinavian people melted special types of rocks to form an extremely durable glassy “glue” that fused the stone wall into an impenetrable matrix. The process is called vitrification. Today, that ancient ingenuity is being unearthed in hopes of protecting twenty-first century Americans from a different kind of threat—the radioactive waste oozing from leaky storage tanks at Hanford, the nation’s most contaminated nuclear site. From 1943 until it was shut down in 1987, Hanford produced large amounts of plutonium that fueled atomic weapons during WWII and was later stockpiled during the Cold War. Since the federal cleanup effort began in 1989, the government has spent billions of dollars mopping up residual radioactive and chemical wastes, 56 million gallons of which remain stored in rusty underground tanks. Experts say a better solution is to vitrify that waste into glass logs that would last for centuries using a replica of the rugged Broborg glass. It would also save taxpayers millions each year. The ancient glass project, as it’s informally known, is composed of an international team of scientists from universities, national laboratories, the U.S. Department of Energy (DOE), the Smithsonian Museum Conservation Institute, and more. Leading the effort to reverse engineer the exact methods and ingredients used to make Broborg glass is John McCloy, associate professor of mechanical and materials engineering at Washington State University. 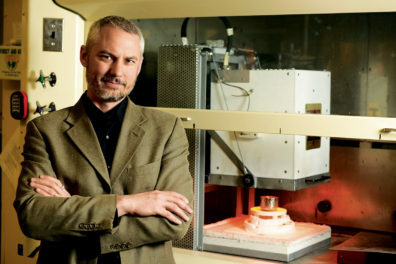 He also founded the WSU vitrification research program in 2013 and has a joint appointment with the Pacific Northwest National Laboratory (PNNL) in Richland. McCloy is not your typical engineer, however. He also holds a master’s degree in cultural anthropology and professes a life-long love of ancient technologies. As he talks about the unique adventure of studying Broborg, you can see a hint of the gold prospector’s twinkle in his eyes. At the molecular level, glass evokes a certain sense of alchemy. The translucent material is neither completely solid nor liquid but something in between. And, despite the way it sparkles in the light, glass is not composed of crystals but is instead an amorphous substance that can interact with a wide variety of atoms. That flexibility allows scientists like McCloy to dabble with the ingredients when making glass. They can adjust the recipe to produce a glass specifically designed to trap nuclear waste particles. It’s good news for Hanford, where the waste storage tanks bubble with a thick yellow-brown sludge containing a witch’s brew of radionuclides such as uranium, plutonium, cesium, and technetium. The muck is also packed with leftover production chemicals and corrosion products including aluminum, zinc, lead, and copper. Though isotopes like cobalt-60 have short half-lives and decay quickly, others, like plutonium-239, remain hot for ages. The idea of using vitrification to contain this waste first arose during the 1970s with the advent of environmentalism and growing concern over the dangers of radiation. Scientists agreed the toxic material should be stored in an impervious, solid form that would remain stable for thousands of years while the radioactivity safely dissipated. The task of choosing that form fell to a U.S. scientific committee which evaluated a vast array of materials as possible candidates. According to their reports, the overwhelming choice was borosilicate glass—a substance that is sturdy, stable, and easy to produce. Since then, glass has been successfully used for vitrification in the United Kingdom, Germany, France, Korea, India, China, Russia, Japan, and Switzerland. It is also in use at the West Valley Nuclear Facility in New York and the Savannah River Site in South Carolina. But Hanford presents the biggest challenge yet. Projected to cover 65 acres, Bechtel National, Inc., under contract with the DOE, is designing and constructing the world’s largest radioactive waste treatment plant, called the Hanford Waste Treatment and Immobilization Plant, or Vit Plant for short. But first, researchers must develop a glass tough enough to survive at least 10,000 years of weathering. It’s not an easy task. Typical laboratory modeling can only predict deterioration in terms of decades. Natural glasses, like million-year-old obsidian, add nuance but still leave unanswered questions. In something of a middle ground, McCloy and his colleagues are pioneers in the investigation of the glassy material used in vitrified hillforts like Broborg. Their efforts to decipher this “puzzle preserved in stone” could lead to the development of nuclear waste glasses able to withstand the test of time. Unfortunately, Broborg’s rocks don’t part with their secrets easily. McCloy and his colleagues must painstakingly unravel the 1,500-year-old mystery bit by microscopic bit. Their initial scouting expedition began at the foot of the rock-strewn ruin after a long flight to Stockholm in February 2016. “It was a pretty amazing experience,” says McCloy, recalling the adventure in his WSU office last September. “Snowing but not too cold—it was kind of surreal. “We walked through some woods with large boulders scattered about. In the distance, we could see the site—it looks like low walls of rubble piled in two rings at the top of the hill. Although similar sites contain melted rocks resulting from lightning strikes, cooking fires, or enemy attacks, the walls at Broborg appear to have been made deliberately for defensive purposes. These vitrified ramparts were constructed with chunks of local granite and smaller, greenish rocks called amphibolite that were used as the fusing material. McCloy says the Swedes melted rocks in boxed sections using charcoal to increase the firing temperature. They may have also added moss or other wet material to elevate humidity and create the optimum furnace conditions. “It was the pre-Viking era and they had been making iron for 1,000 years prior to that,” he says. “For me, realizing what they were able to do at that point made our technology and our self-assessment of our own abilities as humans seem kind of small. 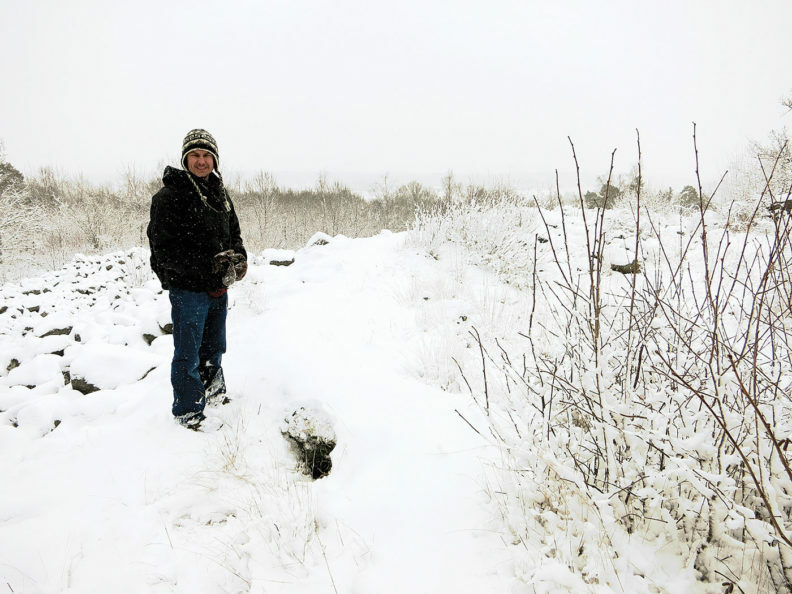 It was Kruger who came up with the idea to study vitrified hillfort glass in 2013 while chatting with Swedish waste disposal researcher Rolf Sjöblom during an environmental conference in France. 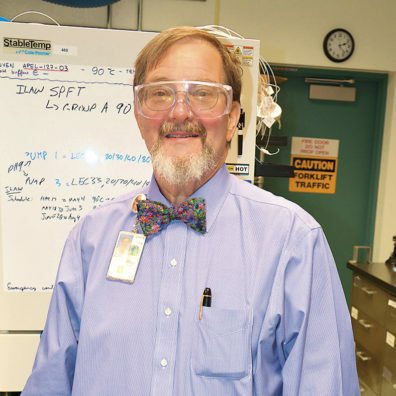 Kruger, engaging and cheerful in his round glasses and flowered bowtie, leans across a table at PNNL explaining how the chance meeting further led to an introduction with Swedish geologist Peter Kresten. For 30 years, Kresten had collected samples from vitrified forts scattered across Europe and he kindly agreed to share a few from his personal museum. The artifacts are now under the expert care of Carolyn Pearce who has been sitting quietly next to Kruger. Orginally from England, Pearce is now a staff scientist in the geosciences group at PNNL and fellow member of the Broborg expedition. She gives a brief project overview and then escorts us to their laboratory where we don protective glasses. With gloved hands, Pearce unlocks a small metal cabinet and withdraws a box. “We store the artifacts in museum-grade specimen boxes with special paper,” she says. 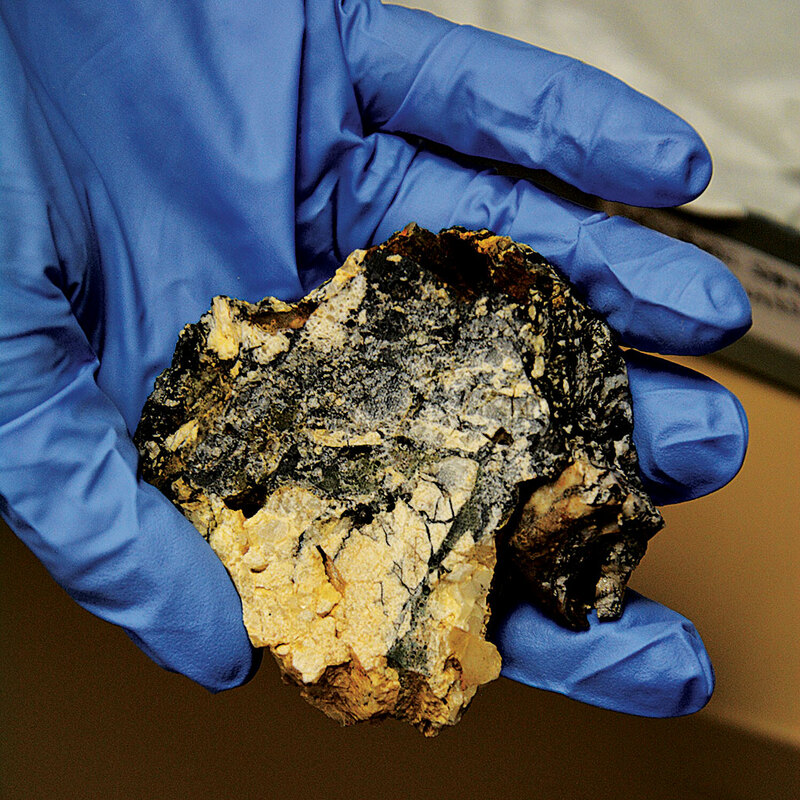 Carefully unwrapping a large, brick-like chunk of rock that appears to be glazed with white icing, Pearce explains that two kinds of glass formed at Broborg—clear and dark. The clear glass, with its high sodium content, is very similar to that used to vitrify low activity nuclear waste or LAW. The dark glass is high in iron and analogous to material used for treating high level waste or HLW. Kruger and Pearce analyze both types of glass to determine how it degrades through processes like weathering, corrosion, and the microbial action of amoeba, bacteria, and fungi. Their primary focus, however, is on the clear glass. “By adopting highly abusive tests, we can show that glass is a very durable material,” says Kruger. “Typically, we grind glass into fine powders and put it through 200 degrees Celsius steam, or cut it into wafers and submerge them in water. To better determine how Broborg glass truly degrades over time, Kruger and Pearce are developing a new accelerated aging test in collaboration with Vanderbilt University and the University of Sheffield in England. The goal is to ultimately develop a test that will reflect aging in thousand-year increments. Once in place, they will test the artifacts and use that data to model what happened at Broborg 1,500 years ago. This will be followed with tests on new glass made from the reconstructed recipe McCloy is developing. If the results match, they’ll be in business. McCloy’s chemical synthesis lab dominates most of third floor Dana Hall in the Voiland College of Engineering and Architecture. The old 1930s lab, with its low ceilings and traditional fixtures, is just one of the five laboratories he oversees throughout campus. Here, with state-of-the-art equipment, McCloy’s graduate students tease out the specific elements and processes needed to concoct a replica of the hardy Broborg glass. One autumn afternoon, he introduces a few of them as they work on various projects. 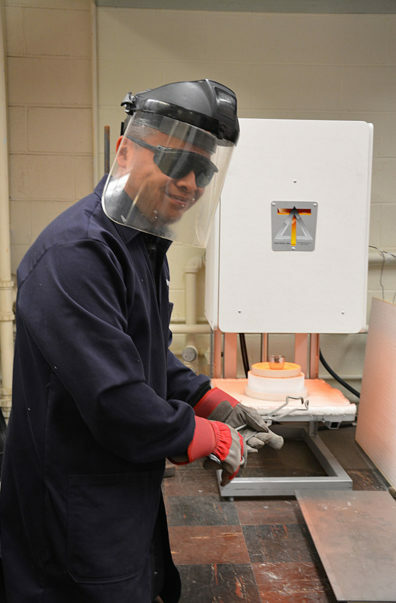 Kneeling beside a small, boxy furnace, doctoral candidate José Marcial is patiently melting a bit of ordinary glass. Dressed in blue coveralls, heavy red gloves, and a welding helmet, Marcial periodically peers into the furnace’s tiny window. When the temperature reaches 860 degrees Celsius, he opens the door and removes a crucible full of molten glass with a long pair of silver tongs. Gently, he pours the liquid glass onto a metal plate to cool. McCloy says a similar process is used to melt amphibolite, the glue that fused the granite Broborg boulders together. 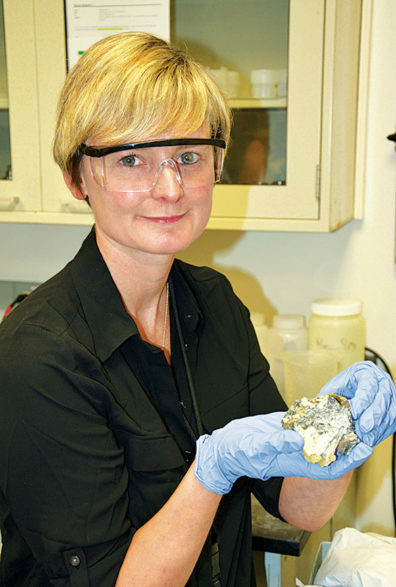 In the lab, McCloy tries to replicate their actions by heating the amphibolite to different temperatures. At 750 degrees Celsius, for example, it develops a copperish sheen. By 1,000 degrees Celsius, the rock begins to transform and by 1,200 degrees Celsius, he says it appears glassy. As the texture changes, so, too, does the rock’s mineral composition. They track this metamorphosis by identifying the mineral content of each sample at different stages of melting—noting crystals of quartz, feldspar, mica, olivine, and others. This is followed with a series of high-end tests that zero in on the sample’s chemical structure and physical properties. The process is complicated by the fact that the rock’s mineral content also varies depending on where it was located at the Broborg site. Another wild card is determining how water played a role in the melting process. Though it’s still too early for conclusions, McCloy says he’s starting to get a handle on the sequence of changes that occur as the minerals undergo extreme heating. “We’re studying samples from five different sites and trying to find the boundaries—or edges—of what is normal,” he says. McCloy has no shortage of helping hands—his students are keen to melt, grind, and test the samples in order to extract their secrets. They especially enjoy the “alchemy” of pouring glass. Last October, McCloy, Kruger, and Pearce returned to Broborg with a team of Swedish archeologists to collect samples directly from the vitrified walls. Their hope is to better understand environmental impacts as well as to gather clues about ancient production methods. McCloy also went armed with a special drill for obtaining magnetic core samples, on loan from the Pacific Northwest Paleomagnetism Laboratory at Western Washington University in Bellingham. The lab can measure magnetism in the rock’s crystals and accurately date Broborg glass production to within 50 years. Despite a few glitches with the drill, McCloy says they had a productive week at the windy, mushroom-dotted excavation site, patiently watching as archeologists cut their way through the 18-inch-thick wall. While McCloy was busy sifting through prehistoric rubble with Kruger and Pearce, Hanford installed two new melters in the Vit Plant’s Low Activity Waste Facility, where giant machines will eventually convert nuclear waste into 4-by-8-foot glass logs. According to DOE, the facility will begin treatments as soon as 2022, and is scheduled to be fully operational for both LAW and HLW by 2036. The bulk of Hanford’s radioactive waste is LAW and is slated for burial onsite. The HLW will eventually be shipped to the national nuclear waste repository. Meanwhile, work will continue on the ancient glass project. Kruger says that within five years, they should have enough data to “support the use of the accelerated aging test with a high degree of confidence.” The reverse engineering project is likewise moving toward completion. The beauty of all this effort is that reconstructed Broborg glass has the potential to trap and hold more nuclear waste than other types of glass, says Kruger. That means more efficient containment of radionuclides and fewer stainless steel containers to bury at Hanford. Which translates into significant savings for America’s collective pocketbook. Not to mention a bit of relief and considerable health and safety benefits for citizens of the Pacific Northwest—especially those who call Hanford’s spare, high-desert country their home. Cleaning up Hanford’s nuclear waste is a tough job any way you look at it. Despite extensive remediation efforts, scientists still struggle to solve a multitude of lingering problems—most related to radioactive material leaking from rusty underground storage tanks. Among the most critical is the question of how quickly those radionuclides can travel through the soil and when they might reach the groundwater. It’s a question that Jim Harsh and Markus Flury, professors in crop and soil sciences at Washington State University, are trying to answer. Their specialty is studying the way microscopic particles carry chemicals and radioactive elements through soil and water. These colloidal particles, as they’re called, can accelerate the migration of contaminants within the environment. The two were invited to investigate Hanford when troubling core samples indicated a radionuclide called cesium had leached farther into the subsoil than expected. No one knew why. Working with researchers at PNNL and other national laboratories, Harsh and Flury demonstrated that colloidal particles bind cesium and carry it along “piggyback.” It turned out to be a short ride, however, as cesium is quickly stripped off by larger particles in the soil. Though the finding wasn’t the definitive answer Harsh and Flury were hoping for, it did provide a positive outcome. They now know that cesium, with its relatively short half-life, will lose most of its radioactivity before reaching the groundwater. Therefore, cesium-contaminated soil can be left to decay in situ. It’s a different story with technetium-99, a radionuclide with a very long half-life. Technetium-99 is one of the most widespread contaminants at the Hanford site and quite difficult to remove. Unlike cesium, scientists expected the element to move quickly through the soil but instead something is slowing it down. Harsh and Flury speculated that perhaps a substance called sodalite is holding technetium-99 in place under the storage tanks. Sodalite is a “framework mineral” that acts like a tiny cage to trap other elements and ions. They thought sodalite might trap both cesium and technetium-99. As it turned out, their studies showed sodalite has little impact on the movement of either element. But Harsh says sodalite cages are probably very important for transport of highly radioactive elements like plutonium and uranium. As an example, he points to the Nevada Test Site, 65 miles north of Las Vegas, where plutonium is mysteriously migrating much faster than anticipated. One step forward, one step back. The earthy detective work continues.